Once you have created algos in ADL, you may deploy them using the Algo Dashboard. This makes your algos available for use within X_TRADER. The Algo Dashboard is accessible from the X_TRADER Control Panel by selecting insert image (the Algo Dashboard icon). Warning: The ability to deploy algos is controlled by your login attributes to the Algo SE server as defined in TT User Setup. The Algo Explorer pane allows you to deploy, view, and manage algos in an easy to use tree structure. Click the plus (+) sign to expand the tree and the minus (-) sign to collapse the nodes on the tree. The top level of the tree is split into two branches: My Algos and Public Algos. Note: If at some point in the future you want to change the share status, you can do so from the Algo Explorer Pane Context Menus. Displays algos that you chose to share with others, or others shared with you. Warning: Once an algo owner has started a private algo, users sharing an order book with the algo initiator on the Algo SE and all TT Gateways used by the algo can manage (Pause/Run) that private algo, even though the Share parameter is not enabled. Using the tree structure, you may deploy either private or public (shared) algos. Select the Algo SE server in the My Algos section to which you would like to deploy your algo. Click the Deploy button .This display the Algos Dialog Box with a list of algo source files. Algos have a file extension of .algo. Tip: You may also right-click the desired Algo SE server and select Deploy... from the right-click context menu. Navigate to your algo file and click (the transfer button). This moves the algo file to the Algos column. 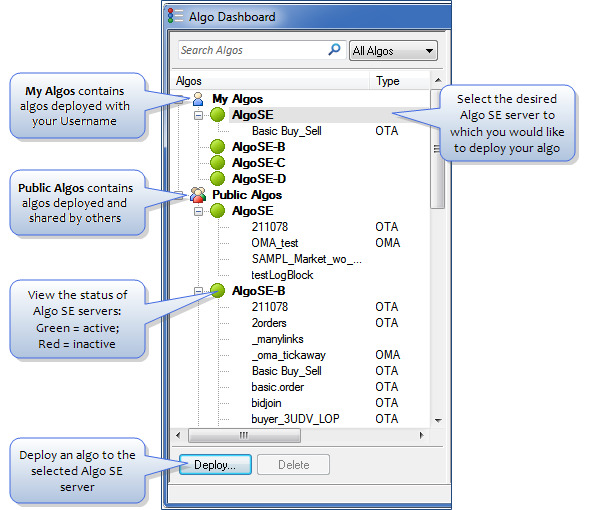 Select the desired Algo SE server in the Algo Server list. By default this is set to the Algo SE you selected in Step 2. Notice the Share parameter. Using this parameter, you can choose "Don't Share," "Share with Selected," or "Share with All." Refer to Sharing Algos in the Algo Explorer Pane. Note: Both the persistence and password can be change in the future if needed; see Updating Algos for more information. Click the Deploy button to deploy the algo to the Algo SE server. The private algo displays in the My Algos section under the Algo SE server to which the algo was deployed. Select the Algo SE server in the Public Algos section to which you would like to deploy your algo. Tip: Administrators can only deploy public algos by selecting an Algo SE server listed in the Public Algos section. Users that roll up to the administrator can view, start, and manage the algo. Notice the Share check box is disabled. The Share parameter is automatically enabled when you are deploying to a server listed in the Public Algos section. If necessary, you may enable the Share parameter at a later time. Click the Deploy button to deploy the algo to the Algo SE server. The shared algo displays under the Algo SE server to which the algo was deployed in your My Algos section and in the Public Algos section for those with whom you share an order book. Warning: Each deployed non-shared algo on the Algo SE server must have a unique name per Member Group Trader ID. 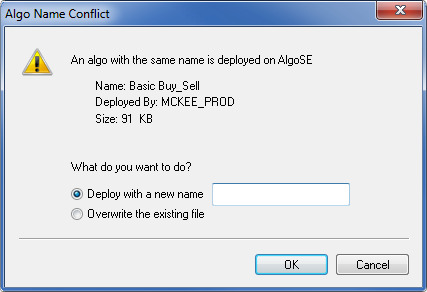 The Algo Name Conflict dialog box displays when deploying an algo using the name of an existing non-shared algo on the server. When a naming conflict occurs, you may either deploy the algo with a new name or overwrite the existing algo residing on the server. Tip: You may choose to deploy and persist an algo to the Algo SE server using the name of an existing shared algo already residing on the server. This duplicate instance is private (non-sharable) and cannot be seen by others sharing an order book in their Public Algos list. However, users can manage (Pause/Run) these private algos once the owner has started them. When an algo is deployed, the algo's source code is sent to the selected Algo SE server. The Algo SE server compiles the source code and loads the compiled code into memory. Enabling the Persist option saves the algo source code to disk in an encrypted format. When the Algo SE server is restarted, persisted algos are reloaded into memory allowing you to run your algos without re-deployment.